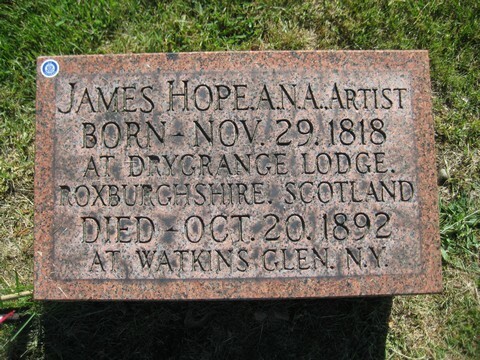 James Hope was born in Drygrange, Roxboroughshire, Scotland, on November 29th, 1818 or 1819. After his mother died in Scotland, his father brought him to Canada to live, where he died about 1831. There is a tradition passed on that when James was 15 years old, he walked from the farm he lived on in Canada, to Fair Haven, Vermont. In Fair Haven he apprenticed as a wagon maker. He saved his money and went to Castleton Seminary. An injury kept him inside for a while, where he tried painting, and found that he had a talent for it. He taught painting at Castleton and became known as a landscape painter, in the style that is now known as the Hudson River School. He is known for many of his paintings, including "View of Poultney, Vermont" and "Yosemite Valley". He opened a studio in New York City, where he spent the winters, returning to Castleton in the summers. 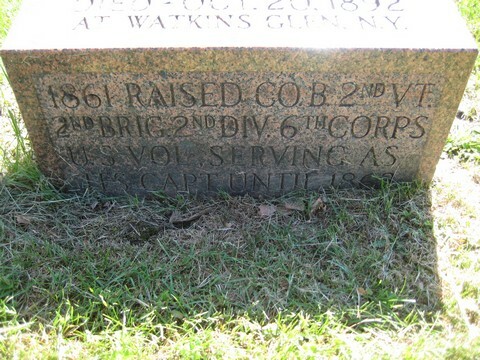 He joined the Second Vermont Volunteer Infantry on May 16th, 1861, and was chosen Captain. He took part in 11 battles, and later during the war became a map maker and scout. During this time he made sketches of what he saw on the battlefield, and later turned these into large oil paintings, which were exhibited around the country. 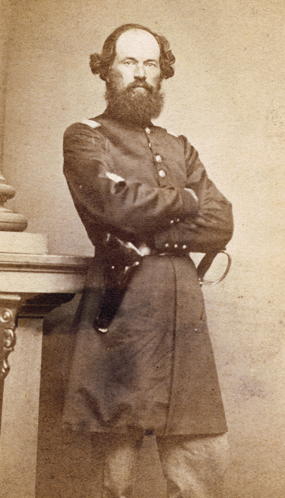 He is possibly best known for the five, twelve foot long paintings he did of the Battle of Antietam. After the war he became an agent for a Middletown (Vermont) mineral springs company in New York City. In 1872 he moved to Watkins Glen, New York, where he built his art studio. He remained there his until his death in 1892. He is buried at the Glenwood Cemetery in Watkins Glen. After his death, the gallery closed and fell into disrepair. A flood in the 1930's damaged and destroyed some of his work. His paintings of Antietam were purchased by a collector, and were further damaged. In 1979 the U.S. National Park Service purchased these paintings and restored them. "The Aftermath at Bloody Lane"
The Vermont Historical Society has a biography with an additional photograph of him, and a collection of his letters. Article contributed by Peter Flood. Paintings courtesy of the Antietam National Battlefield, National Park Service.